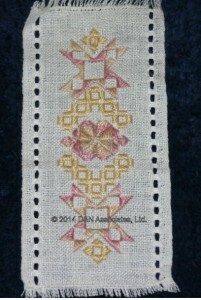 Each kit includes a lacy edged 20 count Lugana fabric for the bookmark, thread(s), size 22 and 24 tapestry needles, a needle threader, a color photo of the finished bookmark, chart, complete instructions and illustrations for each stitch. Thread supplied in this kit was Sullivans Overdyed Pearl Cotton #5 – Grand Canyon. Approximate size is 8.5 inches by 3.5 inches in size. 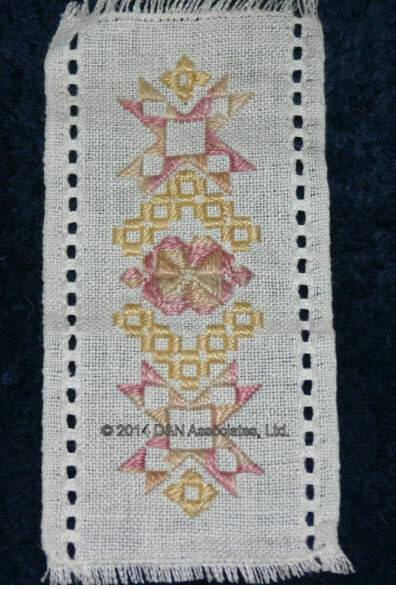 You will easily note that I decided not to do the eyelets and also I decided to use a purchased banded linen in place of the lacy edge finished linen bookmark that was part of the kit.